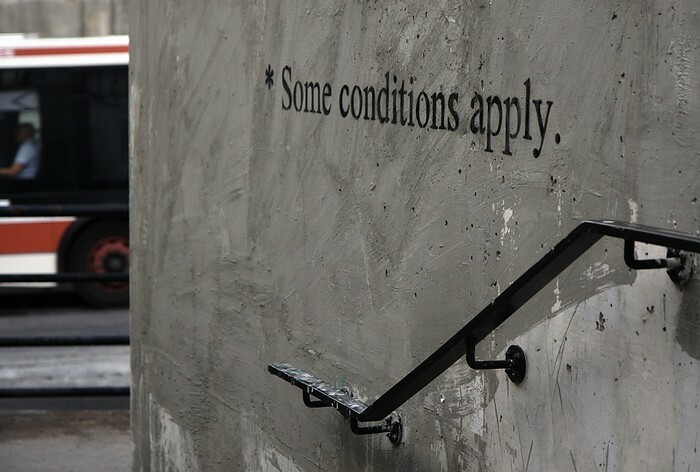 August 7, 2011, in the stairway going up to the West Toronto Railpath on the south side of Bloor St. "* Some Conditions Apply" stenciled over a patch of wall that was recently re-de-graffiti'd (yes, that's officially a word now). It's a constant back'n'forth game around here, as graffiti shows up on the walls, then gets sloppily painted over by the City. I believe the "Some Conditions Apply" phrasing here is a commentary about the various states of legality / illegality, and sometimes uncertain approval processes for legalizing artwork.